To successfully apply new technology to older lifts and enhance performance and reliability we draw on our experience in both new construction and maintenance. Typically, we computer model both the existing and the proposed systems. These studies yield a series of before and after statistics including average and maximum passenger waiting times, total trip times and car loading percentages. This information allows the building owner to make informed cost versus benefit analyses for various component families as well as for the total system. 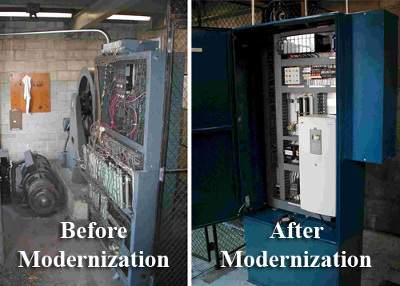 During modernization programs scheduling can be as important as technology. We use our ability to predict reduced lift group performance along with our experience in job scheduling and labor union negotiations to develop detailed project schedules. Adherence to these schedules is verified by frequent, as often as daily, job site inspections followed by punch list surveys and acceptance testing.